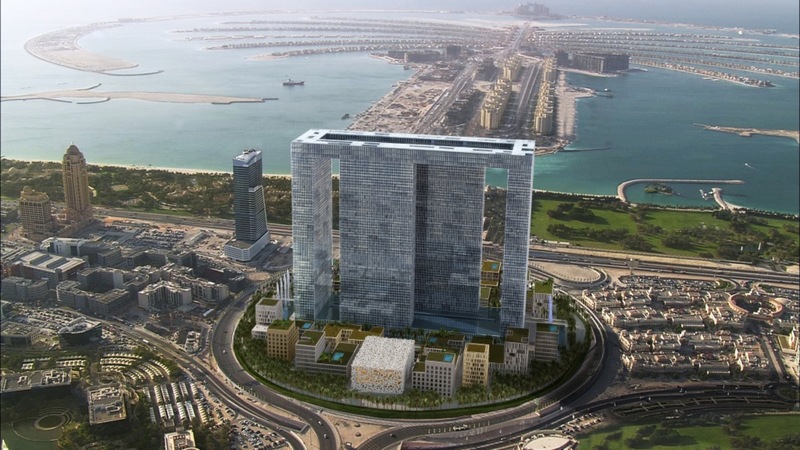 Dubai Pearl is a world-class, mixed-use, 22 million sq. ft (approx. 2 million sq. m) integrated development being developed by Pearl Dubai FZ LLC. The construction began in 2009 but put on hold due to the slowdown of construction in the city. However, in early 2014 a Hong Kong-based investor injected USD1.9bn into the project, and the project should have started up again in second quarter of 2014 (but no sign of builders yet). The four high-rise buildings with the sky bridge are in terms of utilization, design, engineering and aesthetics a unique composition. All towers are multifunctional buildings with hotels, offices, residences and sky palaces. Each utilization has its own lobby with connections to retail, conference-centers and elevators. The 73 floor high development will ultimately provide a home for approximately 29,000 people. Dubai Pearl’s initial handover is scheduled to commence in December 2017. Within this composition the high-rise buildings are provided with a ‘plane’ skin, which also protects them from climatic influences. According to the particular utilization segments the proportion of open, closed or translucent elements differentiates the facades. Central to the concept of Dubai Pearl is the maximization of space efficiency. The architecture allows for column free interior spaces, thereby allowing an interior space utilization efficiency of more than 20% than what is standard, something that is unrivaled in this region. At street level a low-rise city centre will interact harmoniously with the symbolic tower and landscape to create a unique character and space. Almost half of the site area will be open space creating a socially interactive, integrated city environment. The development will be pedestrianized with climate-controlled walkways offering a safe space to maneuver and a 24-hour lifestyle.